This is a popular Taiwanese recipe. 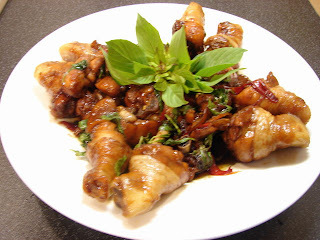 The chicken is braised with an aromatic sauce which is salty, spicy, sweet and very fragrant. Anyone who has tried Vietnamese caramel pork will for sure love this recipe. Traditionally the recipe is for one whole large chicken. The 3 cups here refer to 1 cup of sesame oil. 1 cup cooking wine and 1 cup of soy sauce. For a healthy option, you can cut down the amount of soya sauce and sesame oil. Very simple recipe and moreish. The fragrance of sesame oil and wine will fill your kitchen for hours. 1. Add couple of tbsp of sesame oil in pan or wok, add garlic and ginger, stir till fragrant, then add chicken and stir fry till the pieces turned white on the outside. 2. Add remaining sesame oil, wine, soy sauce (taste before you add too much for your taste) and sugar. Stir and bring to a boil. Then simmer till the sauce is reduced and meat is cooked. 3. Stir in chilli and basil. Garnish with basil if wish. Great with plain rice and plain stir fry chinese veg. That a nice piece of garnish for your dish. Great idea. I found a place with free recipes at http://www.wokfusion.com, or you can visit http://www.youtube.com/wokfusion for more cooking tips. That was just a sprig of Thai sweet basil.